I typically stay away from blogging about current events, but the recent response to Hurricane Harvey touched me. The outpouring of people willing to step in and help other humans was encouraging to say the least. I know there’s so much yet to be done, and that brings me to the other side of something that has been pulling at me lately. As Hurricane Irma now advances, our attention shifts and we have another potentially tragic situation facing us. The reality is that there are significant challenges happening all around us. We don’t focus on them because the general media, and social media, goes for the most tragic hoping for the worst. Thankfully humans chose to show their best. We have already forgotten the recency of many other situations which concerns me. I am embarrassed that we have become so myopic. We live in a global community, and yet we only concern ourselves with items that are within the US, or that directly affect us. I know this is generalizing and that it doesn’t reflect so many that serve and give willingly of their time and money to countless efforts. It is the reality for many though. What has been sticking with me during this time of unrest and turmoil is that we have a choice. The endless banter of negativity and divisiveness can be overwhelming and disheartening because it comes at us from all angles. However, we don’t need to add to this. Ever. The humanity that was shown during Harvey is who we are as people. We can, and should be, the great humans that we were created to be. If we can lend a hand to those who are facing disaster, we should. I would also encourage you to consider being compassionate on an on-going basis and not just during trying times. We have people in and around us every day in our homes, our neighborhoods and our workplaces that are facing a variety of situations and circumstances. I would especially encourage my peers in HR to be genuinely compassionate in their roles. We have tended to shy away from this because we don’t want to get “too close” to people in the event that we have to address them some time in the future. Taking that stance is sad to me. Why in the world would expecting the worst to happen help us in practicing HR? Why not expect the best in others instead? I understand that there will be people that frustrate us, and we may be the one who frustrates someone else. But, if we continue to expect the worst, that’s what will occur. Every day people come to work facing situations that may seem easy to handle for some, but may be extremely challenging for others. This is where compassion comes in. It takes no effort or cost to listen to someone. People may not always expect us to solve things for them. They just want someone to hear them out. You may be able to help them organizationally or personally, but listening needs to occur first. 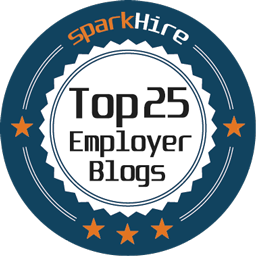 Please understand that every employee wants to be acknowledged, heard and engaged. Every one. I hope that compassion becomes our norm and that when it needs to elevate, we jump in just like we are now. See the best in others. 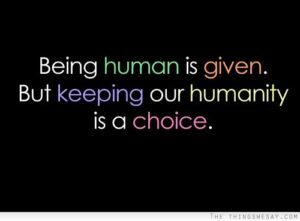 We are better when we are always being human !! Previous Previous post: Chores !! Next Next post: Tie Dye, Ice Cream & T-Shirts ! !